Organ concerts aren’t usually a big attraction, but David Schelat drew a respectable crowd to his Market Street Music Festival Concert on Sunday, October 23, 2016 at First & Central Presbyterian Church on Rodney Square in Wilmington. Schelat took the audience on a wonderful journey from Bach to Schelat in a program that demonstrated not only his musicality and virtuosity, but also the breathtaking capabilities of the church’s Gabriel Kney organ — the only one of its kind in the mid-Atlantic region. Schlelat devoted the first half of the program to works by J.S. Bach, believed by many to have been the greatest composer in the history of Western music. Indeed, the selections here amply demonstrated that Bach was much more than a mere mathematical counterpoint machine — which is why he is accorded such importance by composers of the Romantic era and beyond. The concert opened with a performance of Bach’s most recognizable work, the Toccata & Fugue in D Minor (565). The church nearly seemed to shrink under the mighty sounds of that infamous opening motif. Schelat turned in an energetic yet deliberative reading, revealing details of this intricate and powerful work which are usually glossed over in more frenzied renderings. Schlelat then offered three chorale preludes from the Schubler, Leipzig and Orgelbuchlein (Little Organ Book), which represent the summit of Bach’s sacred music for solo organ. Some of the pieces were very familiar, like the Schubler chorale prelude Wachet auf or Sleepers Awake, BWV 645. Schelat’s gentle reading of the beautiful melody of this simple Lutheran hymn revealed the quiet sanity of Bach. Likewise, Schelat’s understated approach to the chorale prelude from the Orgelbuchlein O Mensch, bewein dein Sunde gross, BWV 622 brought out not only the pain and regret in the opening of the piece but also highlighted the curious serenity and mystery in the music. The Leipzig selection Herr Jesu Christ, dich zu uns wend, BWV 655 offered a nice contrast to the previous two. Its infectious rhythms and lighter texture made the music a joyous, swirling experience. Schelat bookended the section with the quietly monumental Prelude and Fugue in B Minor, BWV 544, one of Bach’s more mature essays in the genres and a fitting complement to the pyrotechnics of the opening Toccata and Fugue in D Minor. The second half of the program featured more modern fare, opening with Hindemith’s rarely performed Sonata I. Schelat delivered Hindemith’s sparse textures with clarity and articulation. The rhythms were crisp yet never mechanical, giving the reading an invigorating sense of purpose. By contrast, Vierne’s diaphanous Clair de Lune, Opus 53, No. 5 seemingly dissolved metrical rigidity, producing an almost ethereal quality while the organ sang the deeply affective melodic line. Schelat concluded the program with one of his own compositions, an organ sonata in three movements: Folk Song, Sarabande and Allegro. 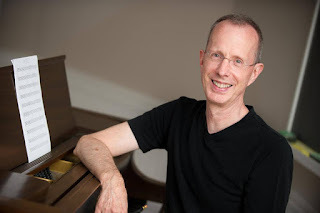 The short melodic piece was written in 2011 for colleague Michael Brill who premiered it in France. Most interesting was the first movement — Folk Song — which featured the melody played in the petals accompanied by arpeggiated harmonies in the keyboard. Has It Really Been 525,600 Minutes...Times 20? RENT Celebrates a Milestone at The Playhouse. Julia Mason is the Marketing Manager for The Buccini/Pollin Group. Her additional passions include her website, positivelyglamorous.com, making homemade ice cream and the great outdoors. Rent 20th Anniversary Tour by Jonathan Larson at The Playhouse on Rodney Square is the revival of Larson's 1996 Broadway landmark that encompasses social issues and unveils the dark realities individuals face through powerful music and dance. Although a serious premise, the audience will definitely experience a few chuckles throughout the thought-provoking musical. The production opens up with Benny — Mark and Roger’s previous roommate — purchasing the building in which the two, along with a unique group of close-knit homeless people, reside. Benny secured funding for the building from his wealthy father-in-law, to fuel his desire is to build a high-tech cyber-arts studio on the property. Benny’s first step toward his goal is ensuring everything goes smoothly, but the residents are not about to leave without a fight. Maureen, Mark's former girlfriend, is happy to be in charge of the protest. Benny offers a deal to Mark and Roger: Stop the protest and they can remain rent-free. However, things do no go as planned, and chaos erupts (which Mark videotapes). From there, everyone is locked out of the place they once called home. I should note that this was my very first time seeing Rent, and I’m so grateful I was able to experience it at the historical Playhouse on Rodney Square. Throughout the performance, what stood out most to me (besides the powerful music) was the stage décor and the lighting; it really brought the musical to life and was much more interactive than plays I have seen in the past. My favorite character by far was Angel, played by David Merino. His voice, energy and dance skills were incredible, and you could feel is love for the character radiating throughout his performance. A newcomer to the theatre scene, Aaron Harrington, who played Tom Collins, has a deep, beautiful voice that also stood out among the extremely talented cast. Overall, the play was wonderful, and it engulfed the audience, getting them to interact a few times. The person that joined me (who chooses to remain anonymous) even became unusually teary-eyed! There is only one day left of this performance, tonight (October 30). Don’t miss your chance to see it — even if you have seen Rent in the past — this cast will make it a memorable experience! The Delaware Symphony Orchestra opened its 2016-17 Chamber Series Tuesday, October 18, at the Hotel du Pont’s Gold Ballroom with stellar performances of two of the most important works of the chamber music repertoire: Schoenberg’s Verklarte Nacht and Vivaldi’s iconic The Four Seasons. Schoenberg and Vivaldi might seem like an odd pairing, but both works explore an insightful journey via the pictorial marriage between poetry and music. Inspired by a poem by Richard Dehmel, Verklarte Nacht describes a conversation between a man and a woman as they walk through a dark forest under a brilliantly expressive night sky. The woman is pregnant with a child of a different man. The man she is walking with loves her and tells her he is prepared to accept her unborn child as his own. The work unfolds in five sections which correspond to the structure of Dehmel’s poem. The various emotions of the two characters — love, pain, guilt, forgiveness — find their equivalents in Schoenberg’s passionate music, making the work one of the first examples of program music written for a chamber ensemble. Originally scored for string sextet, DSO Music Director David Amado opted for the expanded version for string orchestra. The group of 22 strings produced a meaty performance that emphasized the dramatic structure of Verklarte Nacht but never at the expense of the score’s lyrical beauty. The textures were appropriately bass heavy, yet every line came through with exceptional clarity, allowing the counterpoint to drive the music and lead the ear through the dense harmonic web. The cadences, where suddenly a radiant major chord wells up from the dour depth, produced a profound sense of exaltation. The second half of the program featured Vivaldi’s The Four Seasons — one of the most recognizable works of the classical music repertoire. Like Verklarte Nacht, The Four Seasons conveys a journey through spring, summer, autumn and winter. Each season is introduced by a poem, possibly composed by Vivaldi, that offers a description of what experiences the music is about to conjure up: The heat of summer; the peasant celebrations and imbibing of autumn; the violent storms of spring; and the cold and ice of winter. 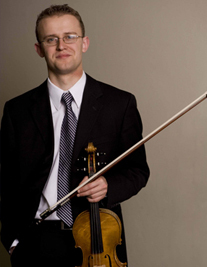 DSO Concertmaster David Southorn was nothing less than brilliant as soloist in these four “evergreen” concertos. He delivered it all — a powerful sound; immaculate precision and compelling agility in the furious figurations of the fast sections; impeccable phrasing and a polished lyricism in the more tranquil sections. This was a zestful performance that continued unabated until the final note was struck. Southorn was ably supported by the 22 string players. This was a beautifully balanced performance with a nice contrast between soloist and orchestra. The programmatic drama of the score was neither shortchange nor overdone, leaving the impression that each participant had contributed something important. Brandywine Baroque opened its 2016-17 season with a wonderfully planned concert of 17th and 18th Century French music. 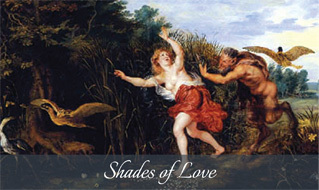 The program — titled “Shades of Love” — was brief in description but generous in its offerings, providing the perfect showcase for the talents of its five instrumentalists, two harpsichordists and soprano Laura Heimes. The music sampled various genres of Baroque instrumental and vocal music, offering a glimpse into the world of the underplayed but brilliant music of the French court. The concert opened with Michel Pignolet de Monteclair’s chamber cantata Pan & Sirinx composed around 1716. The cantata relates the myth of Syrinx who, pursued by Pan, was turned into reeds by water nymphs. Pan, discovering the effect of his breath across the reeds, turned them into his flute. Like many Baroque vocal works, the cantata alternates between reflective arias and narrative recitatives. Heimes delivered the arias effortlessly and exquisitely, allowing the melody to flow its course without hindrance. Her soprano gleamed in the recitatives, coaxing just enough reverberation from The Barn at Flintwoods. Flutist Eileen Grycky conveyed the instrumental effect of Pan’s pursuit in the final three sections of the cantata, her playing augmenting the ensemble in timbre and depth. Grycky was equally effective soloing in the Sonata Op.2, No. 5 in G Major by Jean-Marie Leclair (1697-1764), one of the sonatas for which the composer offered the choice of violin or flute. Her warm burnished tones shape the exquisite phrasing of the slow movements yet convey the Italian-inspired fire and energy in the fast. Leclair’s Eighth Sonata engages the violin (Edwin Huizinga) and viola da gamba (Donna Fournier) in polite dialogue that becomes more animated with chains of trills in the Finale. Huizinga captured the joyfulness of Sonata Op. 12, No. 6 in C Major by Louis-Gabriel Guillemain (1705-1770) with the pure, expressive tone of his violin, while Grycky’s flute perked up the entire ensemble, especially when she had rising figures to play. Gambists Fournier and John Mark Rozendaal explored the changing textures and rhythms of Les batteries by Jean de Sainte-Colombe (fl. 1658-87- c.1701). The two returned after intermission with an exquisite yet deliberate rendering of the quirky but beautiful L’Arabesque by Marin Marais (1656-1728). The second half of the program featured two main works: Pieces in F by Louis Couperin (1626-1661) and Orphee, a cantata by Louis-Nicolas Clerembault (1676-1728). The harpsichord is a mesmerizing instrument in the hands of the right artist, and Brandywine Baroque Founding Artistic Director Karen Flint is one of those artists. It was a genuine pleasure to hear Couperin’s F Major played with dignity and clarity and expression. This was a performance to remember. Heimes returned to conclude the concert with a performance of Orphee. This retelling of the Orpheus legend with a happy ending is replete with gorgeous melodies and embellishments which made it a superb showcase for Heimes’s wide vocal range and dramatic talent. A nice way to end an engaging concert! 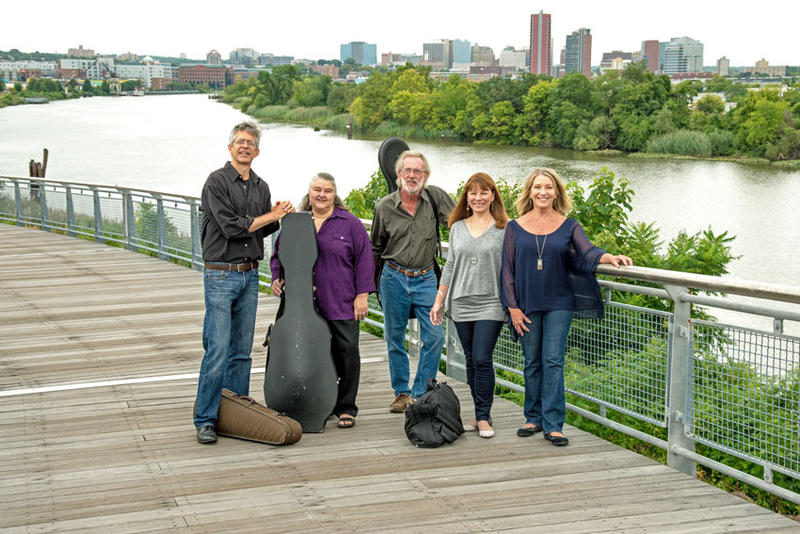 Mélomanie opened its 2016-17 Wilmington concert series at The Delaware Contemporary on Sunday, October 9 with a program that was both demanding and fascinatingly varied. The program started off with a delightful rendering of Telemann’s Paris Quartet 3 in G Major. A description of the performance can be found in the titles of the movements themselves: Gracieusement, Vite, Gai. Gracious and spirited are exactly the qualities this music requires — and what the ensemble delivered. Flutist Kimberly Reighley played a magical Baroque flute, rich in tone with spot-on intonation. She blended perfectly with Christof Richter’s violin, making their intertwining lines an endless source of listening pleasure. Gambist Donna Fournier supplied a judicious bass line: prominent where needed yet merging seamlessly with Tracy Richardson’s sublimely supportive harpsichord. In a rare treat, Richardson soloed in a World Premiere of Michael Stambaugh’s Suite for Harpsichord. Stambaugh is a rising young (b.1990) Philadelphia-based composer whose unfettered imagination shows that an 18th Century instrument has just as much to say in the 21st Century. The work — written during the summer — unfolds in four short movements (a fifth is being reworked): The Machine Comes to Life, A Mischievous Prelude, A Light Dance and Invention. Opening with a blizzard of notes and fluctuant harmonies and rhythms, the piece is a whimsical mélange of jazz, rock, heavy metal and funk which, oddly enough, did not seem so far removed from the 17th Century. One audience member thought it quasi-programmatic, as it followed the path of a machine from its “birth” to its taking on human characteristics and capabilities — a notion that surprised and intrigued the composer. The playing was often difficult and taxing, but Richardson was superb and her efforts were appreciatively received by the audience. The history of Western music is littered with tales of lost masterpieces and what-might-have-beens. Philipp Heinrich Erlebach (1657-1714) became one of those unfortunates when in 1736 when all but 70 of his 1000 compositions were destroyed in a fire at the court library at Rudolstadt. The Sonata 5 in E Minor is just one of six sonatas to survive. As was common for the time, it was scored for violin, viola da gamba and basso continuo. But Erlebach’s sonatas differ from those of his contemporaries in that he gives the viola da gamba a genuinely independent part. In addition, Erlebach aims for a mixture of German, Italian and French styles: the dance movements being mainly Italian while German polyphony dominates the opening and closing movements. Violinist Richter and gambist Fournier exhibited a deep appreciation for the strong character of this sonata, and their performance offered a pleasing and effective balance in their dialogues. The concert closed with the Promenades for Flute, Violin and Harpsichord by Czech composer Bohuslav Martinu. Written between 1937 and 1944, the piece reflects the composer’s reaction to the horrors of World War II. The work opens calmly enough with a Bach-like allegro and air but then morphs into a sinister scherzo and a bitter, edgy finale. Reighley is impressive, playing with the precision and pristine quality she’s noted for, yet somehow managing to deliver a strident tone the music demanded. The Little Mermaid is such a delightful show for the whole family and a great way for parents to introduce their children to theater. This exciting production will enchant both the young and the young at heart! Lynne Lew at Scuttle and Sarah Robertson as Ariel. Director Tom Marshall has assembled a wonderful cast and crew to bring this Disney favorite to the stage here in Wilmington. With a captivating “underwater” set designed by Cam Hay and sea-like animals and mythical sea creatures created through gorgeous make-up design by Kellye Porter-Martin, fabulous wigs and hair designed by Debbie Norkavage, and inventive costumes designed by Nancy Kennard (I especially enjoyed the “umbrella jellyfish”), the setting and characters made famous in the 1989 animated film truly come to life. I’m sure most people are familiar with the story about a princess mermaid (Ariel) who lives with her father (King Triton) and six older sisters in the vast ocean, but is intrigued by humans and has become more interested in their lifestyle than her own. This intrigue intensifies when Ariel saves the dashing Prince Eric from drowning after being overthrown from his ship during a storm. Since King Triton doesn’t trust humans and believes they are at fault for his wife’s untimely death, Ariel is forbidden to go to the ocean’s surface with her friends and is meant to stay in her aquatic home and concentrate on her singing – a talent she shared with her deceased mother. Wanting an opportunity to be with Eric, Ariel defies her father and makes a deal with his evil sister Ursula – a sea urchin that has been banished by Triton to live far under the dark sea. The wicked deal allows Ariel to become human for three days, but she will be mute and her voice will be kept by Ursula. In order to remain human and to regain her voice, the prince must kiss her before the three days are up, or Ursula will keep her voice and Ariel will become one of Ursula’s slaves. Sarah Robertson leads the cast as the curious and adventurous Ariel. She is charming as the innocent young mermaid and has a gorgeous voice that sweetly soars throughout the theater. Ashley Baker is frighteningly good as Ursula. She has an amazingly strong voice that evokes fear in the audience. Conner Malley as Prince Eric and Jonathan Dalecki as King Triton are captivating and have a great presence on stage. 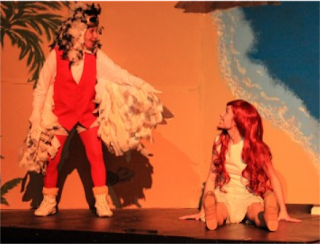 Lynne Lew (Scuttle – the sea bird), Adelaide Nourie (Flounder) and Will Rotsch (Sebastian – the crab) bring great humor and excitement as the friends who share in Ariel’s adventures. Don’t miss this classic musical with memorable songs written by Alan Menken and Howard Ashman. Like me, I’m sure you’ll find yourself singing along to “Under the Sea” and “Kiss the Girl,” among many others! The Little Mermaid closes on October 30. For tickets and additional information visit www.dechildrenstheatre.org. The Music School of Delaware opened its 2016-17 season Wednesday, September 28, 2016 by gifting its supporters with gorgeous renderings of two of the best loved works for string orchestra: Grieg’s Holberg Suite and Tchaikovsky’s Serenade for Strings in C Major. 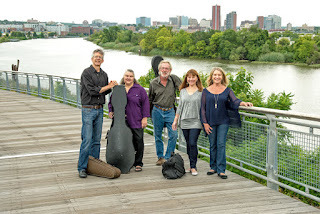 Maestro Simeone Tartaglione conducted a string orchestra composed of music school faculty and three invited guests violists Sheila Browne and Marka Stepper and bassist Arthur Marks. The program opened with Grieg’s Holberg Suite for String Orchestra. Composed to honor the memory of 18th Century Norwegian writer Ludvig Holberg, Grieg cast the work in the musical language of the 18th Century. Tartaglione applied a light touch, playing up the individual character of each of the work’s dance-like movements. Following the brisk opening Praeludium was a stately Sarabande featuring a lovely dialogue between cellists Lawrence Stomberg and Eric Coyne. The Gavotte recalled the formality of the court while the Musette contrasted with a folksong quality. The deeper strings imparted a profound solemnity to the Air, one of Grieg’s most beautiful creations. The concluding Rigaudon paid tribute to Norwegian folk violinists as it featured some virtuosic bowing by concertmaster Stefan Xhori. Tartaglione conducted with authority and passion as he led the orchestra through Tchaikovsky’s Serenade for Strings in C Major, an intensely personal work that the composer intended as homage to Mozart whom he viewed as the “Christ of music.” The Serenade is in a vastly different league than the Holberg: Rich in harmonic and melodic invention, it is also more abstract in character and hence more enduring. The Serenade is Tchaikovsky at his brilliant best and Tartaglione and the musicians did it proud with flair, charm and beauty of tone. The orchestra was nimble and agile in its execution of the second movement — the Valse — with its numerous and sudden harmonic shifts. The third movement — the Elegie with its fugal elements — was ensemble playing at its best. The Finale was played with great virtuosity, bringing the concert to a close with rousing applause. Hiroko Yamazaki, piano & Amy Leonard, viola. 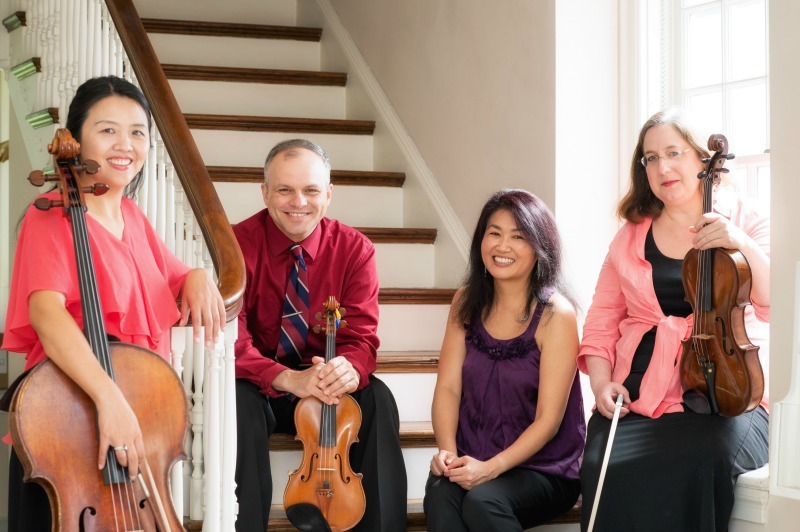 Pyxis Piano Quartet opened a new season of Market Street Music Festival Concerts Saturday, October 1, 2016 with its usual combination of superb playing and interesting programming. The ensemble consisted of Luigi Mazzocchi, violin; Amy Leonard, viola; Jie Jin, cello and Hiroko Yamazaki, piano. The bulk of the program featured two works written a century apart: Mozart’s Piano Quartet No. 2 in E-flat Major (K. 493) and Richard Strauss’ Piano Quartet in C Minor, Op. 13. Luckily for us, when Mozart’s publisher canceled his commission for a series of piano quartets, the composer had already completed the second quartet and it was published by another firm in 1786. K.493 is one of Mozart’s greatest compositions and a classic of the genre with its pristine form, gracious themes and exquisite interplay between instruments. The first movement — Allegro — begins intensely but offers gracious themes throughout. The Larghetto is a richly conceived slow movement featuring an exquisite interplay among piano and strings. The third movement Rondo — Allegretto — is full of fire and energy with a prominent piano. Pyxis was most sympathetic to this spacious and outgoing work. Particularly attractive were the gently springy rhythms and exquisite phrasing of the strings in the first movement and Yamazaki’s beautifully shaped phrasing in the Larghetto. Whereas Mozart wrote his quarter at the height of his musical maturity, Strauss was a mere 20 and very much in the thrall of Brahms when he composed his work. The result is an unusual fusion of musical personalities: the gravitas of Brahms and the fire and impetuousness of the young Strauss. Rich and dark, the work is full of blazing energy. The playing has all the attributes you would expect from Pyxis: impeccable intonation and fluid tempos that allowed the music to flow in unbroken phrases. The players were individually excellent, as was Mazzocchi’s rendering of the main theme of the Andante and Yamazaki’s voicing of the chords supporting him. But they are at their best when they function as an ensemble, as in the tight Scherzo or the virtuosic interplay of the closing Vivace. The evening opened sans piano with the playful Mozart En Route (A Little Traveling Music) by Aaron Jay Kernis, past recipient of the A.I. duPont Composer’s Award. Inspired by a letter from Mozart to his father, in which he complains of being jostled during a particularly rough carriage ride, Kerns’ short (three-minute) string trio takes listeners on a whimsical musical trip from Salzburg to Nashville and back. Thematic variation is the rule as familiar-sounding pop styles interweave with the classical tradition with several quotations from Mozart’s Divertimento for Strings, K. 563. Stan Divorski is an artist and avid art and photography collector who lives in Lewes, Delaware. He has a PhD in Psychology from Northwestern University, a Certificate in Painting and Drawing from the Corcoran College of Art and Design in Washington DC and has studied modern art curating at the Chelsea College of Arts in London. The Rehoboth Art League’s 7th Regional Juried Biennial Exhibition is a significant step in the League’s continuing evolution to a regional art force. The work is bold, resolutely modern and abstract. The juror, George Ciscle, focused on the unique and mastery of technique. His emphasis on craft is part of what makes the exhibit current. After decades of the art world emphasizing concept over technique, the quality of execution is increasingly valued. 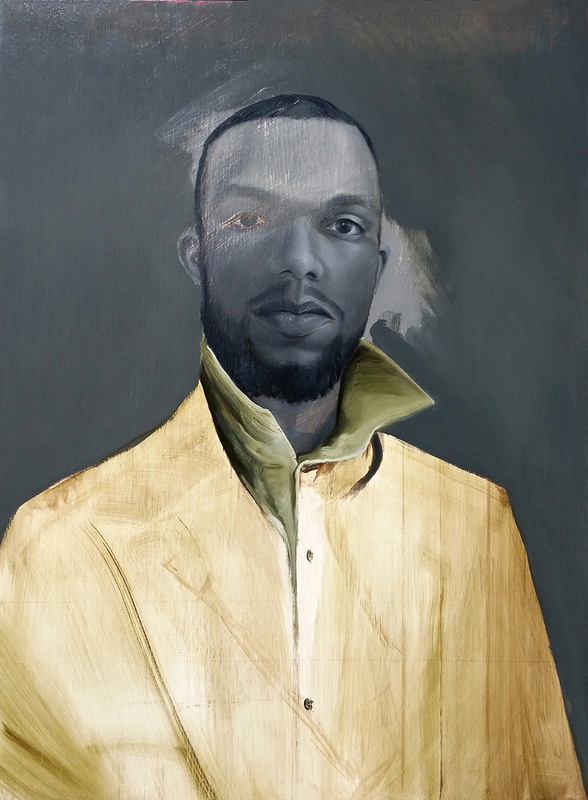 Kyle Hackett’s oil painting “Forward Restraint” was chosen as Best in Show partly because it stood out from the crowd of portraits and partly because of the artist’s command of his medium. In his detached view of the subject, Hackett distresses part of the sitter’s face and leaves part of the background apparently unfinished, reminding us that this is his interpretation of the subject, not a copy of reality. Brook Hedge’s “Still Standing,” a deeply emotional photograph of a gradually subsiding barn garnered an Award of Excellence. Achieving her effects “in camera” rather than through post-processing in Photoshop, she demonstrates mastery of her medium. Harold Ross’ “Still Life with Pencil Sharpener and Steel Ball” initially appears to be an example of the “Photorealism” paintings of the 1960s and 70s. In fact, it is a meticulously crafted digital photographic print comprising 30-plus layers of imagery. It bears greater relationship to the Dutch Masters than to photorealism. “Relevance,” the relationship of art to social issues, is increasingly part of the art world’s language. Amani Lewis’ “The Conversation” examines the current status of African Americans. The central figures in her creation appear to be involved in a calm exchange, but are superimposed over images of angry protest. Protesters can be seen through the figures themselves, illustrating how social upheaval penetrates individual existence. Digitally cut and pasted images printed on canvas worked over with paint evoke the screen printed posters of 20th Century protest movements. George Thompson’s painting “Sometimes ‘IT’ Percolates uphill” depicts the permanent and reflexive damage to the earth of individual acts of pollution. He has chosen a jewel-tone palette rather than the “earthier” palette expected. It is up to the audience to decide whether this choice works against the artist’s intent or leads to closer exploration. George J.E. Sakkal’s photo collage “Climate Change: Earth at the Beginning of the End” depicts the detritus of western existence in a small, densely packed image that invites the viewer to practically stick their nose into the swirling mess. some would dismissively refer to as “wall art.” Missing are “installations” which become part of or transform the gallery space. The closest examples are Sondra Arkin’s Award of Excellence winning “Shadow Drawing,” and Jihyun Vania Oh’s “Trace My Memory.” Ms. Arkin’s wall-mounted wire sculpture is a delicate spiderweb of geometric forms that creates a shadow drawing on the gallery wall. Ms. Oh’s sculpture of leather, paper and other materials -- resembling a post-apocalyptic gas mask -- snakes up a corner of the gallery, stepping from wall to wall. Her ‘s is the only piece that seeks to directly engage the audience by encouraging viewer interaction. Below the work is a small sign that invites the viewer to “Open me.” Pulling a small metal ring opens a trap door, revealing a pop-up that transformed my understanding of the work. Missing in their entirety from the exhibition are examples of video and performance art. It is estimated that there are more than 2.5 million professional artists in the US -- nearly 1% of the population. Taking into consideration the additional number of amateur artists, it is easy to understand the challenge for artists to have their work seen and sold. George Ciscle’s curation demonstrates the value of artists who analyze what has gone before, both in terms of technique and theory, and seek that unique variation that lifts one’s work above the fray. The exhibit is among the best that I have seen at the RAL, but still leaves room to grow.